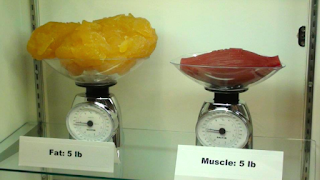 • A pound of muscle takes up about 18% less space than a pound of fat, so as you burn fat and replace it with lean muscle tissue, you'll actually look leaner, not bulkier. • Muscle speeds up your metabolism trying to maintain its existence in your body. This is why you might have noticed that some of the most fit people enjoy more food, while burning more calories, even in their sleep!